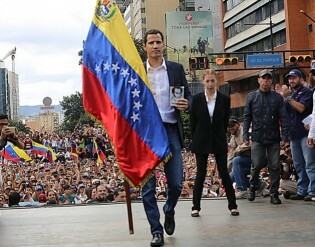 Venezuela entered a new and astonishing arena of political confrontation, with two presidents, Nicolás Maduro and Juan Guaidó, leading the forces vying for power, while Venezuelans once again are taking to the streets to demonstrate their weariness at the crisis, which has left them exhausted. After three hours of paperwork, Katy Rodriguez from El Salvador, who was deported from the United States, finally exited the government's immigration facilities together with her young son and embraced family members who were waiting outside. Why Would an Immigrant Support Trump? Giuseppe DiMarco is 83 years old. He has recognized the U.S. as his home for over 30 years. In the aftermath of World War Two, DiMarco fled an impoverished farming town in Southern Italy in the pursuit of advancement and the promise of wealth he had never known. Cuba's tense relations with the United States under the administration of Donald Trump reflect a scenario of conflict that is not alien to the generation that will take over the country on Apr. 19, when President Raúl Castro is set to step down. Carrying a red plastic bag containing an old pair of shoes and a few other belongings, David Antonio Pérez arrives to El Salvador, deported from the United States. Three friends are relaxing in a quiet courtyard. They speak English with a strong American accent and talk about their disadvantaged neighborhoods. Their tattoos depict a rough life on the street. One of them calls Massachusetts home, while the others grew up in Georgia. The government of St. Vincent and the Grenadines says it hopes that the devastating loss and damage that Hurricane Harvey has wrought in Texas might inspire the government of President Donald Trump to rethink its position on climate change. A leading climate change mitigation and adaptation activist and former climate negotiator in the Caribbean says that the United States could protect its economic and political interest by helping the region to go green. By withdrawing the United States from the Paris Agreement, President Donald Trump abdicated not only leadership but membership of the community of nations cooperating to tackle climate change, the most serious crisis facing humanity. In a last-ditch effort, Germany and China are trying to influence the United States not to walk away from the Paris climate change accord it signed along with 194 nations. This week, Donald Trump will mark his first hundred days as US President. It’s time to assess his impact on the world, especially the developing countries. The apparent and surprisingly abrupt demise in Steve Bannon’s influence offers a major potential opening for neoconservatives, many of whom opposed Trump’s election precisely because of his association with Bannon and the “America Firsters,” to return to power after so many years of being relegated to the sidelines. Bannon’s decline suggest that he no longer wields the kind of veto power that prevented the nomination of Elliott Abrams as deputy secretary of state. Moreover, the administration’s ongoing failure to fill key posts at the undersecretary, assistant secretary, and deputy assistant secretary levels across the government’s foreign-policy apparatus provides a veritable cornucopia of opportunities for aspiring neocons who didn’t express their opposition to the Trump campaign too loudly. U.S. President Donald Trump Thursday night described the deepening Syrian refugee crisis as partial justification for the first direct U.S. airstrike against the Syrian government, even though the United States still bans all refugees from Syria. The U.S. has withdrawn all of its funding to the UN Population Fund (UNFPA), an agency that works on family planning and reproductive health in over 150 countries.